Former Grace Brethren pastor’s wife, Ruby A. Landrum, 103, of Winona Lake, Ind., died Wednesday, Oct. 2, 2013, in her son’s home. 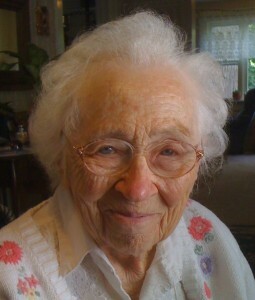 She was born Sept. 19, 1910, Minden, Neb., to Frank Larson and Hannah (Nielsen) Larson. Ruby graduated with honors from Ripon Union High School in 1928, ad later graduated with a Bible degree from the Bible Institute of Los Angeles (BIOLA) in 1930. She received her R.N./nursing degree from Los Angeles School of Nursing in 1932. While at BIOLA she met Clyde K. Landrum from Lost Creek, Ky. Upon Clyde’s graduation in 1936, they were married at the Landrum family home in Lost Creek. She moved from Minden to Ripon, Calif., where she grew up. She was a life-long registered nurse having worked at hospitals in Jackson, Ky.; Louisville, Ky.; Murphy Medical Center, Warsaw, Ind. ; Uniontown Hospital, Uniontown, Pa.; and Kosciusko Community Hospital, Warsaw, where she retired in 1990 at the age of 80. She worked for 2 more years at Grace College in the nurse’s office helping students and finally retired formally at the age of 82 in 1992. She was a member of Community Grace Brethren Church, Winona Lake; loved serving as a full time pastor’s wife with Clyde. They were founding pastors at Leesburg, Indiana, Warsaw Community and Lexington, KY Grace Brethren churches; and pastored Brethren churches in Uniontown, Pa., and Lost Creek. They were instrumental in the founding of their beloved Warsaw Christian School; she was an accomplished gardener and seamstress and dedicated matriarch to her sons, daughters-in-law, grandchildren and great grandchildren. She is survived by two sons: Phil Ray (Lois Kay Nagel ) Landrum, Wheaton, Ill.; Gerald Richard ‘Jerry’ (Kathleen Marie Miller) Landrum, Winona Lake, Ind. ; five grandchildren: Anita Kay (Matthew) Witt; Val Ann (Christopher) Harder; Elizabeth Landrum; Timothy (Julie Anna) Landrum; Rachel Landrum; three great-grandchildren: Mei Ling Witt; Aaron Witt; Amelia Landrum. Preceded in death by her husband: Clyde K. Landrum; parents: Hannah and Frank Larson; two brothers: Chris and George; one sister: Laura. Visitation will take place from 3 p.m. to 4 p.m. Saturday, Oct. 5, Community Grace Brethren Church, 909 S. Buffalo, Warsaw. Funeral services will take place at 4 p.m., Saturday Oct. 5, at Community Grace Brethren Church, Warsaw. Reverend Andy Galvin and Reverend Roy Chapin of Community Grace Brethren in Warsaw will officiate. Private graveside services will take place at Oakwood Cemetery, Warsaw. Memorial contributions may be made to Warsaw Christian School or online at warsawchristian.org. Titus Funeral Home is handling all arrangements. To leave online condolences, visit the Titus Funeral Home website.